Sheryl Sandberg is one year older than I am. She graduated from Harvard Business School; I graduated from Kent State. She is the chief operating officer of Facebook; I am a librarian. We are both women who want to have successful, productive careers. Since I work at the library, I rarely ask for books as gifts. 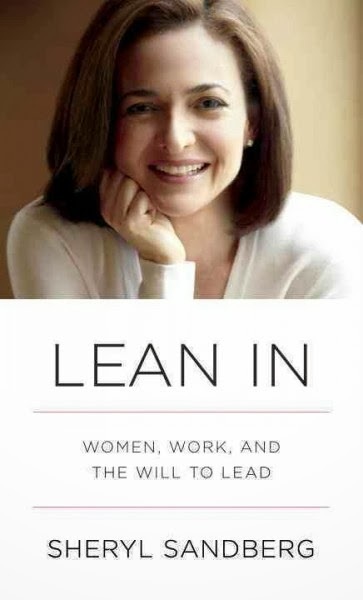 But this year I have requested a copy of Lean In: Women, Work and the Will to Lead. As I was reading the book I was using post-its to mark passages I related to or found inspiring and wanted to go back and read again. When I finished, I noticed there were an awful lot of colorful little flags sticking out of the pages. That’s when I realized I should probably have my own copy for reference. Sandberg’s writing is both personable and encouraging. She has a fantastic education and a wealth of accomplishments behind her, has worked hard and learned that “having it all” is not all it’s cracked up to be. How often have we heard the phrase “It’s not personal. It’s business.”? For many people, the workplace is not only a place to collect a paycheck, but coworkers become friends. Our problems don’t leave themselves at home (have you cried at work? She has. And so have I.) Decisions have to be made and they can be tough decisions. And since many women are not comfortable with disagreement and confrontation, learning how to trust your own judgement, delegate responsibility, and let go of worrying about decisions once they are made can be the toughest part of the job. Sheryl challenges us to step up and gives some great pointers about how to do it.